Gari T, Loha E, Deressa W, Solomon T, Lindtjørn B (2018) Malaria increased the risk of stunting and wasting among young children in Ethiopia: Results of a cohort study. PLoS ONE 13(1): e0190983. Introduction Given the high prevalence of malnutrition in a malaria-endemic setting, improving nutritional status could serve as a tool to prevent malaria. However, the relationship between the two conditions remains unclear. Therefore, this study assessed the association between under-nutrition and malaria among a cohort of children aged 6 to 59 months old. Methods Two cohorts of children were followed for 89 weeks in a rural Rift Valley area of Ethiopia. In the first approach (malaria-malnutrition), a cohort of 2,330 non-stunted and 4,204 non-wasted children were included to assess under-nutrition (outcome) based on their previous malaria status (exposure). In the second approach (malnutrition–malaria), a cohort of 4,468 children were followed-up to measure malaria (outcome), taking under-nutrition as an exposure. A weekly home visit was carried out to identify malaria cases. Four anthropometry surveys were conducted, and generalized estimating equation (GEE) method was used to measure the association between undernutrition and malaria. Results The prevalence of stunting was 44.9% in December 2014, 51.5% in August 2015, 50.7% in December 2015 and 48.1% in August 2016. We observed 103 cases with 118 episodes of malaria, 684 new stunting and 239 new wasting cases. The incidence rate per 10,000 weeks of observation was 3.8 for malaria, 50.4 for stunting and 8.2 for wasting. Children with malaria infection, [Adjusted Odds Ratio (AOR) = 1.9; 95% Confidence Interval (CI), 1.2–2.9)] and younger age (AOR = 1.3; 95% CI, 1.1–1.5) were more likely to be stunted. Furthermore, children with malaria infection (AOR = 8.5; 95% CI, 5.0–14.5) and young age group (AOR = 1.6; 95% CI, 1.2–2.1) were more likely to be wasted. However, stunting and wasting were not risk factors of subsequent malaria illness. Conclusions Malaria infection was a risk factor for stunting and wasting, but stunting or wasting was not associated with subsequent malaria illness. As our study shows that malaria is a risk factor for stunting and wasting, a close follow-up of the nutritional status of such children may be needed. On December 13, 2017, the MalTrials project, a joint venture between Hawassa University, Addis Ababa University, and University of Bergen held International Research Seminar on Malaria. 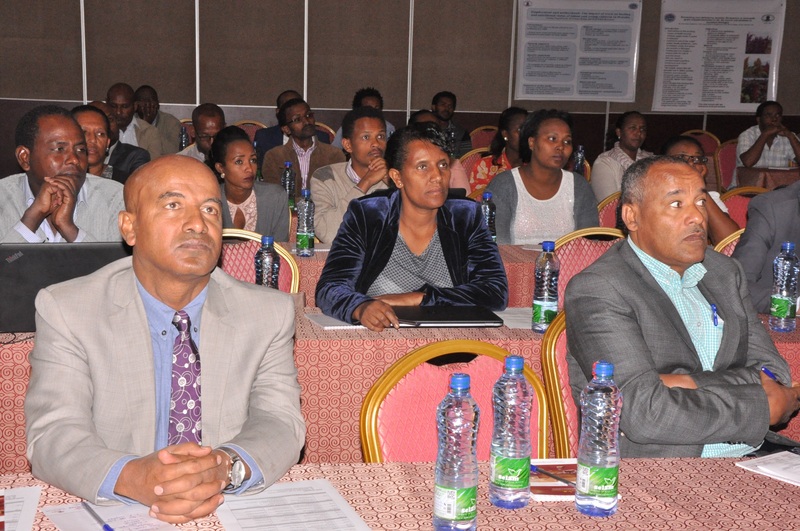 The conference was held at Haile Resort in Hawassa. The Maltrials project, Combining long-lasting insecticidal nets and indoor residual spraying for malaria prevention in Ethiopia: a cluster randomized controlled trial, started in 2013, and the main results were presented at the conference. Gebreyesus SH, Endris BS, Hanlon C, Lindtjorn B: Maternal depression symptoms are highly prevalent among food-insecure households in Ethiopia. Public Health Nutr 2017:1-8. Objective: We aimed to evaluate the association between household food insecurity and maternal depression in Ethiopia. Design/Setting/Subjects: In 2014, we conducted a cross-sectional study in southern Ethiopia, including 591 food-secure and 2500 food-insecure households. We measured depression status of women using the Patient Health Questionnaire-9 validated for Ethiopia, with a cut-off of ≥5. We evaluated household-level food insecurity using a validated Household Food Insecurity Access Scale. We applied Bayesian modelling to evaluate the relationship between food insecurity and maternal depression accounting for other observed characteristics. Results: Among the analytic sample, 80·8 (95 % CI 79·4, 82·2) % of women were living in food-insecure households. The overall prevalence of probable depression (mild and moderate forms) was 4·7 (95 % CI 4·1, 5·6) %. All individual depressive symptoms had a significantly higher prevalence in the food-insecure group, except for suicidal ideation (but small numbers; P < 0·001). In the Bayesian model adjusting for paternal characteristics, there was a significant dose–response linear relationship (trend) between household food insecurity and maternal depression (P<0·01). The adjusted OR (95% Bayesian credible interval) for depression for differing levels of food insecurity were: mild food insecurity, 3·29 (1·63, 6·18); moderate, 3·82 (1·91, 7·45); severe, 12·50 (3·38, 32·70). Conclusions: The study documented a high burden of depression among women who lived in food-insecure households. Given this finding, we recommend integrating mental health in the livelihood programmes in areas suffering from food insecurity. Background Long lasting insecticidal nets (LLINs) and indoor residual spraying (IRS) are effective tools to prevent malaria, but the effectiveness of combining the two are not yet fully understood. This study compared the separate versus combined effect of LLINs and IRS on malaria incidence and anemia. Methods This cluster randomized controlled trial was done in the Adami Tullu district in south-central Ethiopia for 119 weeks, from September 2014 to January 2017. Prior to the trial, we did a pilot study to estimate the sample size, and registered 8 malaria episodes per 10,000 person-weeks of observation (PWO). 6072 households (HHs) were randomly assigned to four intervention arms: LLINs + IRS, LLINs, IRS, and no intervention implemented by the project (control). The primary outcome was malaria incidence. Analysis was based on an intention-to-treat principle. Each arm had 44 clusters with an average of 35 HHs per cluster; the total population was 34,548. PermaNet 2.0 LLINs were distributed in September 2014, and IRS (with propoxur) was carried out yearly. Active and passive case detection were done weekly. Malaria was diagnosed using a rapid diagnostic test (CareStartTM). Anemia was assessed through yearly surveys on children. The yearly rainfall was 60% of expected in 2015 (El Nino effect), entomological studies were simultaneously conducted. Results The overall malaria incidence was 2.91 per 10,000 PWO (37% of pre-intervention incidence), and similar in the four arms with 2.99 (LLINs + IRS), 2.92 (LLINs), 3.01 (IRS) and 2.72 (control). Generalized estimation equation showed that LLINs did not provide individual protection. Entomological findings showed greater outdoor mosquito human-biting activities than indoor. The yearly mean hemoglobin concentrations were similar among the trial arms. Conclusions The malaria incidence was low and similar in the intervention arms. The severe drought might have contributed in too few malaria cases to evaluate the interventions. However, residual transmission could be an important cause of malaria transmission in the area. Our results could be relevant for situations with low malaria incidence. 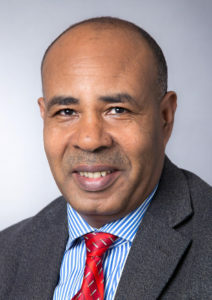 Hailu A, Lindtjørn B, Deressa W, Gari T, Loha E, Robberstad B. Economic burden of malaria and predictors of cost variability to rural households in south-central Ethiopia. PLoS ONE 2017; 12(10): e0185315. Background While recognizing the recent remarkable achievement in the global malaria reduction, the disease remains a challenge to the malaria endemic countries in Africa. Beyond the huge health consequence of malaria, policymakers need to be informed about the economic burden of the disease to the households. However, evidence on the economic burden of malaria in Ethiopia is scanty. The aims of this study were to estimate the economic burden of malaria episode and to identify predictors of cost variability to the rural households. Methods A prospective costing approach from a household perspective was employed. A total of 190 malaria patients were enrolled to the study from three health centers and nine health posts in Adami Tullu district in south-central Ethiopia, in 2015. Primary data were collected on expenditures due to malaria, forgone working days because of illness, socioeconomic and demographic situation, and households’ assets. Quantile regression was applied to predict factors associated with the cost variation. Socioeconomic related inequality was measured using concentration index and concentration curve. Results The median cost of malaria per episode to the household was USD 5.06 (IQR: 2.98–8.10). The direct cost accounted for 39%, while the indirect counterpart accounted for 61%. The history of malaria in the last six months and the level of the facility visited in the health system predominantly influenced the direct cost. The indirect cost was mainly influenced by the availability of antimalarial drugs in the health facility. The concentration curve and the concentration index for direct cost indicate significant pro-rich inequality. Plasmodium falciparum is significantly more costly for households compared to Plasmodium vivax. Conclusion The economic burden of malaria to the rural households in Ethiopia was substantial—mainly to the poor—indicating that reducing malaria burden could contribute to the poverty reduction as well. Nissen A, Cook J, Loha E, Lindtjørn B: Proximity to vector breeding site and risk of Plasmodium vivax infection: a prospective cohort study in rural Ethiopia. Malaria Journal 2017, 16. Background Despite falling incidence and mortality since the turn of the century, malaria remains an important global health challenge. In the future fight against malaria, greater emphasis will have to be placed on understanding and addressing malaria caused by the Plasmodium vivax parasite. Unfortunately, due to years of neglect and underfunding, there are currently many gaps in knowledge of P. vivax malaria. The aims of the present study were to explore the association between distance to vector breeding site and P. vivax infection in rural Ethiopia, and, secondarily, to test whether this association varies with age. Methods A prospective, cohort study of all residents in the Chano Mille Kebele in southern Ethiopia from April 2009 to March 2011 (n = 8121). Weekly household follow up visits included screening for febrile cases (active surveillance). Participants were also asked to contact the local health centre if they experienced subjective fever between visits (passive surveillance). Plasmodium vivax infection was confirmed using microscopy by two independent readers. Information was collected on demographics and household characteristics including GPS-determined distance to vector breeding site. Data was analysed using Cox regression modelling. Results Overall the P. vivax infection rate was 12.3/1000 person-years (95% CI 10.5–14.5). Mean household distance to breeding site was 2449 m (range 1646–3717 m). Fully adjusted results showed very strong evidence of an association between proximity to breeding site and P. vivax infection: rate ratio = 3.47 (95% CI 2.15–5.60; P < 0.001) comparing the group closest to the breeding site (distance < 2100 m; n = 1383) to the group furthest away (distance > 2700 m; n = 2460). There was no evidence that age was an effect modifier in the association. Conclusion Results showed strong evidence that household proximity to vector breeding site is positively associated with P. vivax infection in rural Ethiopia, and that this association is constant across age groups. The findings might influence how net-distribution and indoor residual spraying campaigns are planned, help guide strategies on water resource development by highlighting potential health effects of man-made dams near human habitats, and add to current educational information given to people living close to breeding sites. 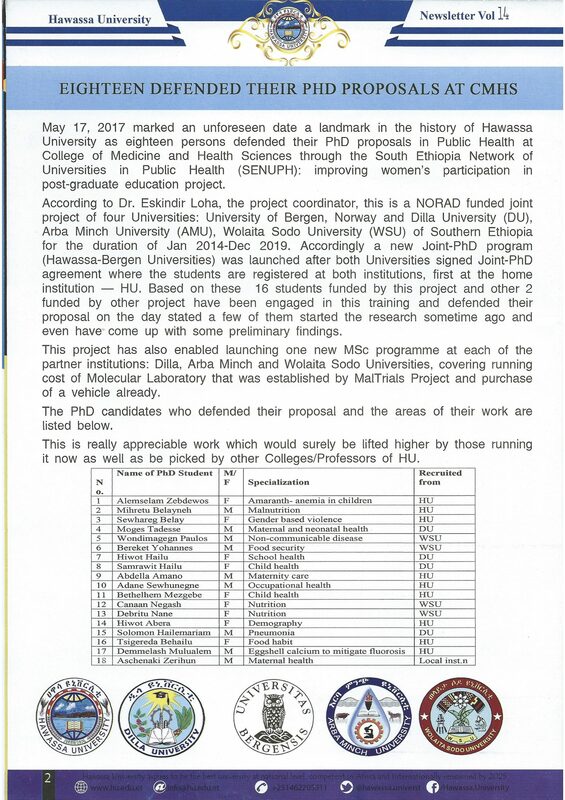 Here is a note in the Newsletter of Hawassa University (No 14, July 2017). Tuberculosis (TB) remains a high-priority communicable disease that causes an enormous burden of morbidity and mortality, and infects one-third of the world’s population. It is the second leading cause of death among infectious diseases worldwide, with more than one-fourth of all preventable adult deaths in developing countries due to TB. The disease disproportionately affects people in resource-poor settings, particularly those in Asia and Africa. In addition, more than 80% of TB cases and 78% of deaths occur in developing countries. The primary causes of the TB epidemic in developing countries are poor socio-economic conditions, an increase in human immuno-deficiency virus and an increase in anti-TB drug resistance, especially the MDR-TB strain. The weak and ineffective national TB control programmes, the poor implementation of infection prevention measures, the poor quality and accessibility to anti-TB drugs, the irrational use of anti-TB treatment regimens and the poor patient adherence are the underlying causes for the emergence of drug- resistant strain including MDR-TB. The emergence of this strain therefore poses another challenge to TB control efforts. TB control aims at detecting infectious TB cases as early as possible, and puts them on standardized anti-TB treatment in order to successfully treat and break the chain of transmission and to avert the emergency of multi-drug resistance. The effectiveness of the TB control strategy mainly depends on the timely diagnosis and treatment of smear-positive pulmonary tuberculosis. The cure of smear-positive pulmonary TB patients is considered to be an important intervention mechanism for the primary prevention and emergency of MDR-TB. As a result, a rapid identification of smear-positive pulmonary TB cases and their effective treatment using combined anti-TB drugs is the cornerstone of the global TB control programme. In 1993, the World Health Organization (WHO) confirmed TB as a global public health emergency and recommended the Directly Observed Treatment, Short Course (DOTS) as a standard strategy to control the disease. In 1994, the World Health Organization designed a Framework for Effective Tuberculosis Control, which clearly designated the core elements of the DOTS strategy. DOTS aims at detecting 70% of infectious TB cases and successfully treating 85% of them to interrupt the transmission, reduce mortality and prevent the emergence of drug resistance. Ethiopia is among the 22 high-TB-burden countries and the 27 high-MDR-TB-burden worldwide. TB is the leading cause of hospital admission and second leading cause of death in the country. The WHO recommended the DOTS strategy, which was piloted in 1992 and nationally launched in 1995, in a few health facilities with a subsequent expansion to all public health institutions. As a result, in 2015 all public and 14% of private health institutions were covered. The overall aim of this thesis is to assess the trends in TB control performance, and to estimate the burden of the disease at the community level to help achieve a better understanding of the gap in improving the TB control programme in Ethiopia. The thesis investigates TB control performance, and estimates the disease burden at the community level. The studies focus on assessing trends in TB case notification and treatment outcomes. In addition, we estimate the prevalence, incidence of bacteriologically confirmed TB cases, as well as the burden of primary and secondary drug resistance TB at the community level. The findings of the studies could also be used to explore area-specific strategies help to improve TB control programmes in Ethiopia. The studies were conducted in Arsi in central Ethiopia, and used cross-sectional and prospective cohort study designs. The studies were conducted in predominantly rural communities and at public health institutions. Most of the papers focus on smear-positive TB, the most infectious form of TB. The study findings show that the trend in PTB+ case notification increased in parallel with the expansion of DOTS population coverage from 18% to 70% over 15 years. The PTB+ case notification increased from 7 to 63 per 100,000 population in 15 years, with an overall increase of 89%. The TB case detection rate (CDR), estimated by the proportion of PTB+ cases notified from the total annual expected PTB+ incidence of the zone, went up from 6.4% to 58.7% over the study period. The overall 15-year average PTB+ case CDR of the zone was 37.7%, which was far below the 70% global target. Moreover, the PTB+ case notification varied across the 25 districts of the zone. The rural residence and population ratio to DOTS sites and age of the patients were associated with a low TB case notification. Between 1997 and 2011, the treatment success rates for smear-positive TB rose from 61% to 91%, with a corresponding decline in treatment failure and default rates. The 15-year average cure rate was 67%, which was lower than the global target of an 85% of cure rate. However, treatment outcomes varied across the 25 districts of the zone. The treatment success rate was also found to be associated with the age of the patient, the patient category and TB/HIV co-infection. Trends in case notification and treatment outcomes are used as proxy indicators to evaluate the TB programme performance. However, to obtain a better understanding of the impact of the TB control programme, we need both baseline and follow-up data on the disease prevalence, incidence and drug resistance burden at the community level. Considering the shortage of resources, we used a less expensive method to estimate the prevalence and incidence of PTB+ and primary and secondary drug resistance, using symptom inquiry followed by sputum microscopy for AFB, culture and a drug-susceptibility test. The results show that there is a high incidence of PTB+ cases. For every case PTB+ on anti-TB treatment, there was an almost equal number (0.96) of undiagnosed BCTB cases in the community. Furthermore, we identified more men undergoing treatment before the survey, whereas more women were detected during the active TB case finding. The history of TB contact was found to increase the risk of developing active TB, thus suggesting the targeting of contact-tracing among household members diagnosed with PTB+ to help capture the undetected infectious TB cases in the community. The estimation of TB prevalence and incidence based on symptom inquiry and sputum microscopy is a less expensive and simple technique. This method might help to generate information on the magnitude of TB in resource-constrained settings. We also found that there is a high prevalence of primary and secondary resistance to any one or more first-line anti-TB drugs and primary and secondary MDR-TB in the study area. The highest prevalence of secondary drug resistance was identified among previously treated TB cases compared to primary resistance among new TB cases. This is primarily due to the poor treatment outcomes among previously treated cases caused by lost follow-up and irregularity of drug intake. The overall 15-year average PTB+ case CDR was 38%, while the cure rate was 67%. So, after 15 years of the DOTS programme, the high proportion of undetected infectious TB cases in the community, combined with increasing primary and secondary drug resistance TB, we conclude that there has been a sub-optimal DOTS performance. 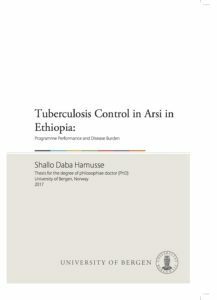 Hence, this thesis underscores the need to improve DOTS performance through devising alternative strategies in TB control programmes in Ethiopia. Daygena TY, Massebo F, Lindtjorn B. Variation in species composition and infection rates of Anopheles mosquitoes at different altitudinal transects, and the risk of malaria in the highland of Dirashe Woreda, south Ethiopia. Parasites & vectors. 2017;10(1):343. Background The transmission of malaria is heterogeneous, and varies due to altitude. The information on whether the transmission of malaria is indigenous or imported to highland areas is scarce. Therefore, this study aimed to assess the species composition and infection rates of Anopheles at different altitudinal transects, and the risk of malaria if any in the highland of Dirashe Woreda, South Ethiopia. Methods This study was conducted in Gato (low altitude; average elevation of 1273 m), Onota (mid-altitude; average elevation of 1707 m) and Layignaw-Arguba (high altitude; average elevation of 2337 m) from August 2015 to April 2016. Anopheles mosquitoes were sampled using Centers for Disease Control and Prevention (CDC) light traps from thirty houses (ten houses from each village). The circum-sporozoite proteins (CSPs) rate and entomological inoculation rate (EIR) of Anopheles mosquitoes were estimated. For the epidemiological survey, malaria cases were collected from laboratory registration books of selected health facilities from (August 2015-April 2016). A cross-sectional survey was done to collect data on malaria vector control activities in each village (August-September 2015). Results One thousand two hundred sixty-eight Anopheles mosquitoes comprising Anopheles arabiensis, An. demeilloni, An. cinereus, An. pharoensis, An. funestus-group, An. pretoriensis, An. christyi, An. ardensis and An. tenebrosus were identified in the study area. Anopheles arabiensis was the dominant species in Gato, whereas An. demeilloni was the dominant species in Layignaw-Arguba. Five mosquitoes, three An. arabiensis from Gato and two An. demeilloni from Layignaw-Arguba, were positive for Plasmodium falciparum CSPs. Plasmodium falciparum CSP rate was 0.4% (95% CI: 0.08–1.15) for An. arabiensis in Gato, and it was 0.64% (95% CI: 0.08–2.3) for An. demeilloni from Layignaw-Arguba. The P. falciparum EIR of An. arabiensis was 8.6 (95% CI: 2.4–33.4) infectious bites/person/nine-months in Gato. Plasmodium falciparum was dominant in Gato (88%) and Onota (57.5%), whereas in Layignaw-Arguba P. vivax (59.4%) occurred most frequently. Increased malaria cases were observed in children age 5–14 years in Gato (P < 0.05), whereas in Onota and Layignaw-Arguba there was no statistically significant difference in malaria cases among the age groups. Households owning at least one long lasting insecticidal net were 92.7% in the study area, and 77.6% slept under the net during the preceding night of the survey. About 64.4% of the households in Gato were protected by the indoor residual spray. However, the spraying was done when the density of local malaria vectors was low. Conclusion Incrimination of Plasmodium CSP positive Anopheles species and the presence of malaria in children under five years in high altitude Layignaw-Arguba may justify the existence of indigenous malaria transmission and the need for effective malaria control. Further investigation and confirmation using more sensitive molecular techniques are however needed to consider An. demeilloni as a proven vector of malaria in Ethiopia.